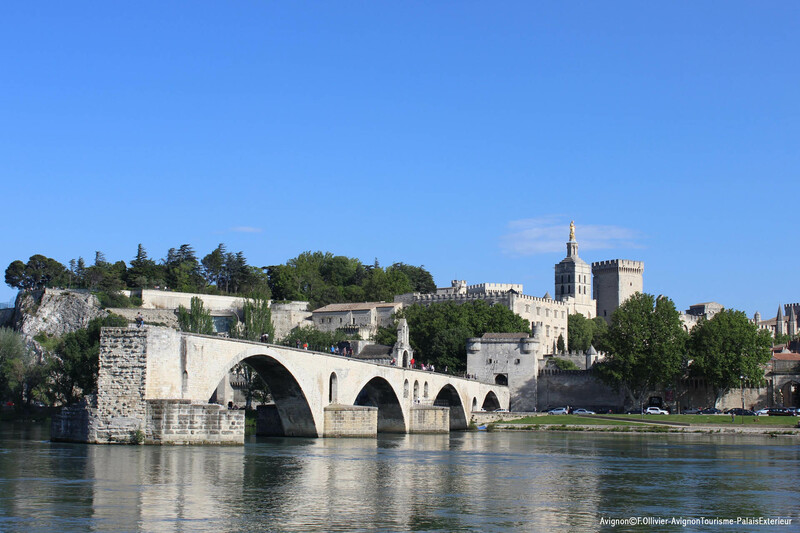 Located on the left bank of the Rhône river, Avignon became the capital of the Papacy at the beginning of the 14th C, when the Popes were exiled from Rome. Pressured by Philippe Le Bel, Pope Clément V moved there at in 1309, allowing the commune to become one of Europe’s largest cities of the time. The historic is dominated by the famous Popes’ Palace, which started being built in 1335, during the reign of Pope Benoit XII, and was expanded and completed by his successor Clément VI in 1352. Ruling at the height of the Papacy, he also bought the entire city from Queen Jeanne of Provence in 1348. In order to satisfy his need for recognition as well as rid the town of fear and uncertainty, Pope Clément VI lived in what was essentially a fortress and had ramparts built around the town center. The Avignon Bridge – known worldwide thanks to the classic song “Sur le Pont d’Avignon”. Built in the 12th C, it was for a long time the only bridge across the Rhône south of Lyon. A large part of the bridge was swept away in the 17th C, and has not been rebuilt since. Le Jardin du Rocher des Doms. Just next to the Palace of the Popes, this little park is on top of the rocky outcrop overlooking the river. It is worth a visit for the splendid views over the river and over the rooftops of old Avignon. At the end of the 13th C, Philippe Le Bel founded a “new city” which quickly grew in population. Understanding its strategic location, he built a mighty edifice at the entrance to the St Bénezet Bridge. The kings Jean Le Bon and Charles V built Fort Saint-André to keep a watchful eye on the neighbouring Papacy. La Chartreuse du Val-de-Bénédiction: A Carthusian Monastery from the 14th C, built by Pope Innocent VI who is buried there. The Chartreuse has been classified as a historic monument since 1905. Fort St André: This medieval fortress stands sentinel by the Rhône River and offers exceptional panoramic views over the Mont Ventoux, the Alpilles mountain range as well as the famous Popes’ Palace. The Fort has a beautiful fortified gate with twin towers and a defensive curtain wall built around the abbey within. La tour Philippe Le Bel: Built in the late 13th C, on orders of King Philip the Fair, the tower offers incredible views of the Fort St André, Villeneuve, Avignon and the MontVentoux. Collégiale Notre Dame: A Gothic style church and cloister built in the 14th C by the Cardinal Arnaud de Via, a nephew of Pope Jean XXIII, classified as historical monuments. The Luberon is a natural park which holds three mountain ranges stretching from Cavaillon to Apt. Its picturesque scenery and rich heritage has attracted many artists, craftsmen and writers. This picturesque village is the most visited in the Luberon region, classified amongst the most beautiful villages in France. It is known for its boutiques, antique stores and art galleries. Renaissance Château: Refurbished by Bernard de Simiane on the site of an old 11th C fortress. Now an exhibition space, it once housed the paintings of Vasarely, a famous Gordes resident, and of the Flemish painter Pol Mara, who also lived here. Village des Bories: Dating as far back as the Stone Age, this village of thirty dry stone huts (dwellings, stables, grain lofts, mills, henhouses and pig sties) is clustered around an ancient bakery oven. Known as the melon capital of France, this town has had an important role in the country’s history. The 2500 year old remains of the ramparts remind us of the commune’s Celtic origins. Cathédrale Saint Véran: A Romanesque edifice which was enlarged in the 14th C.
Baroque Synagogue: A masterpiece of 18th C Comtadin art, it is one of the most remarkable synagogues known. Inside one can visit the famous museum of the “Pope’s Jews” living in the Comtat Venaissin region, where the popes offered protection from persecution.. Birthplace of the 20th C poet René Char, this is an important antique dealers’ village. It was once an industrial center for weaving, dyeing, tanning and papermaking, hence the numerous waterwheels still visible throughout town. The Fountain, an underground river bursting out of the ground in a picturesque setting, can have its flow reach 150 cubic meters per second during high water periods in spring and fall and then subside down to 4.5 cubic meters per second in summer. In any season, this mysterious subterranean stream emerging from the cliff is a beautiful sight. Roussillon: Set atop one of the biggest ochre deposits in the world this colourful village is one of the Luberon’s must-sees. Ménerbes: Both the 13th C century citadel and the 14th C century church of this stunning perched village are worth the visit. Abbaye de Sénanque: This 12th C Cistercian abbey is one of three in Provence, all distinguished by the serene, simple beauty of their architecture. 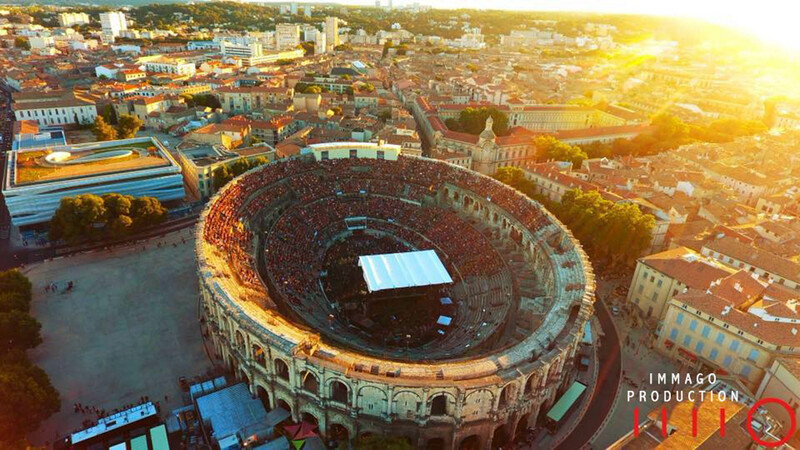 Founded in 46 BC, this town rapidly grew into one of the most important Roman cities of Provence. 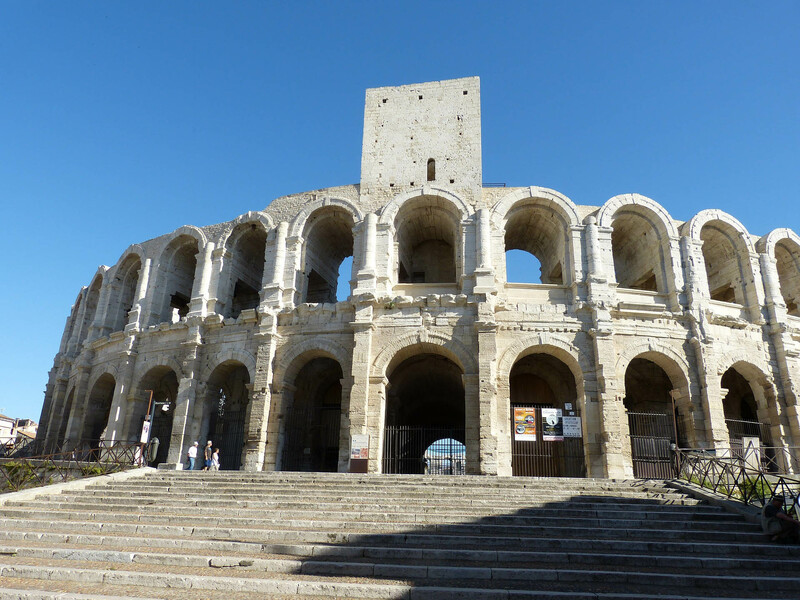 During the 4th and 5th centuries it even became the seat of the Praetorian Prefecture of the Gauls. 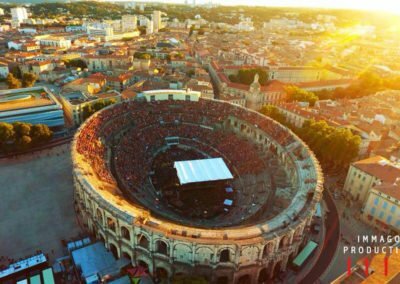 Roman Amphitheater: This majestic monument was built after the famous Roman Coliseum at the end of the 1st century AD to entertain the crowds encircling the infamous gladiator battles. Roman Theater Antique: After the fall of the Roman Empire, this UNESCO World Heritage Site slowly declined as many stones were taken and used as building material in the surrounding area. 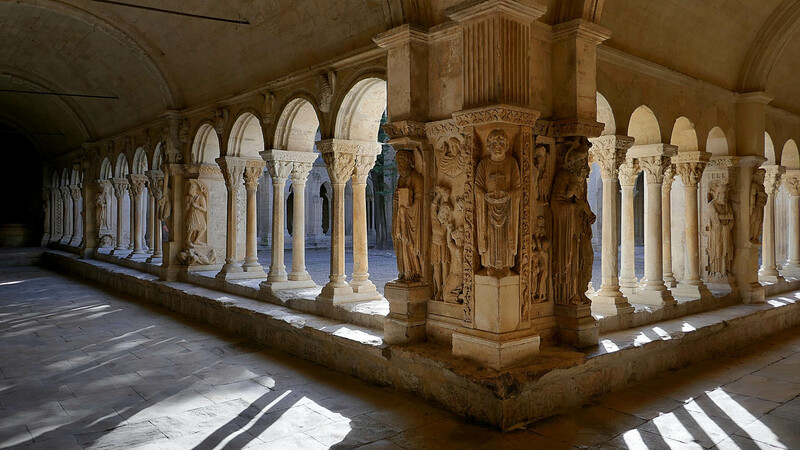 Portal of the Church of Saint-Trophime: This former cathedral with its cloister, high columns and beautiful nave is one of Provence’s major Romanesque monuments. The sculptures of its portal, are considered some of the finest examples of Romanesque sculpture. In the Middle Ages, the warlords of Les Baux de Provence reigned over 79 Provençal communities, ignoring the sovereignty of the Avignon popes. During the wars of religion, they also defied the kings of France by providing shelter to the Protestants. It was Louis XIII who managed to overthrow the lords in 1632 and who ordered the destruction of the fortress. The Citadel: The castle and dungeon are the main remnants of 13th C stronghold built on the site of a Xth C fortress. Panorama: Admire the spectacular views of the Crau, the Alpilles, Arles, the orchards and olive groves from the top of this lofty cliff. Les Carrières de Lumière: Every year, the former limestone quarry houses a spectacular, wraparound sound-and-light art show projected onto its walls and floors. Still a ducal residence, Uzès is a lovely small town that has kept the configuration of a medieval stronghold. It prospered in the 17th C and 18th C, when as first duchy of the kingdom, it traded in silks and fine textiles. La Tour Fenestrelle: The 42 meter high tower dates from the 12th C and is made up of 6 circular levels with a unique, round bell tower. La Place aux Herbes: This lovely central market square, bordered by a stone colonnade, is home to a number of shops, cafes and restaurants. Le Duché: The home of the Dukes of Uzès, this imposing Renaissance castle with high towers is open for visits of the main courtyard and gardens, the 800 year old cellars, and even some furnished rooms of the ducal family. 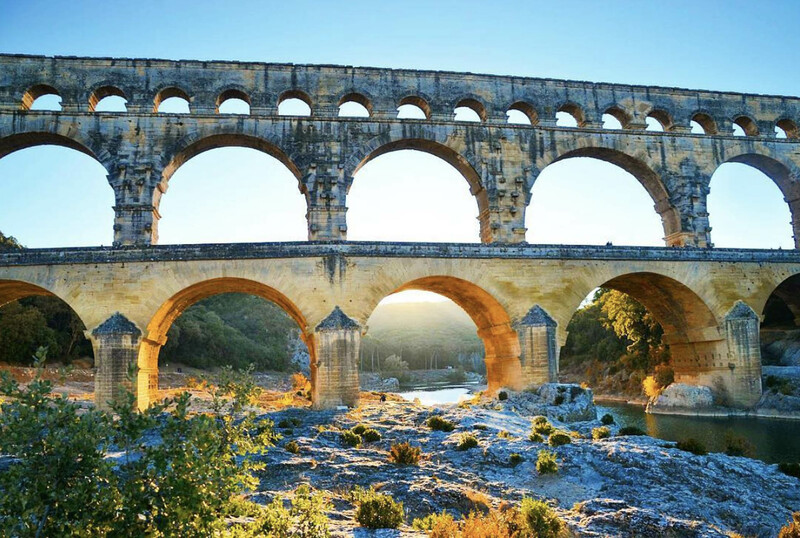 One of the Roman Empire’s most impressive structures, this immense, 2000 year-old aqueduct bridge, with three spectacular tiers of stone arches, joins the two banks of the Gardon river. 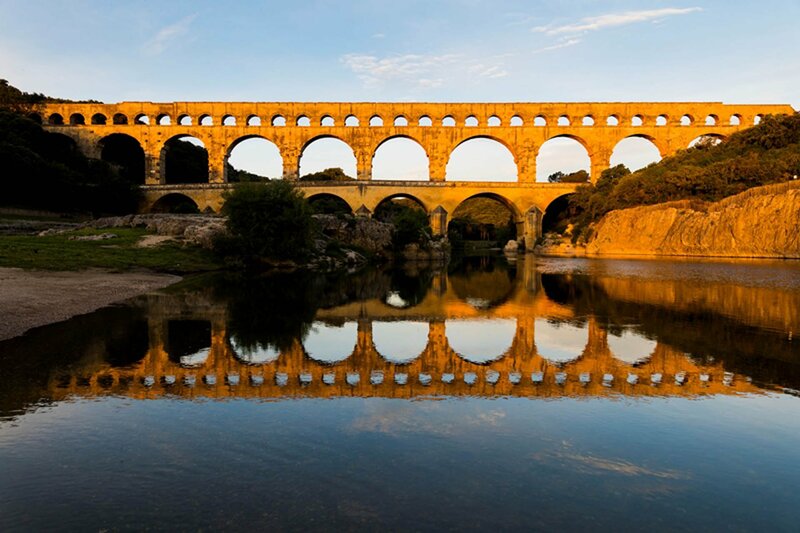 The highest of all Roman aqueducts (over 49 meters high), it used to carry water over 50kms between Uzès and Nîmes. 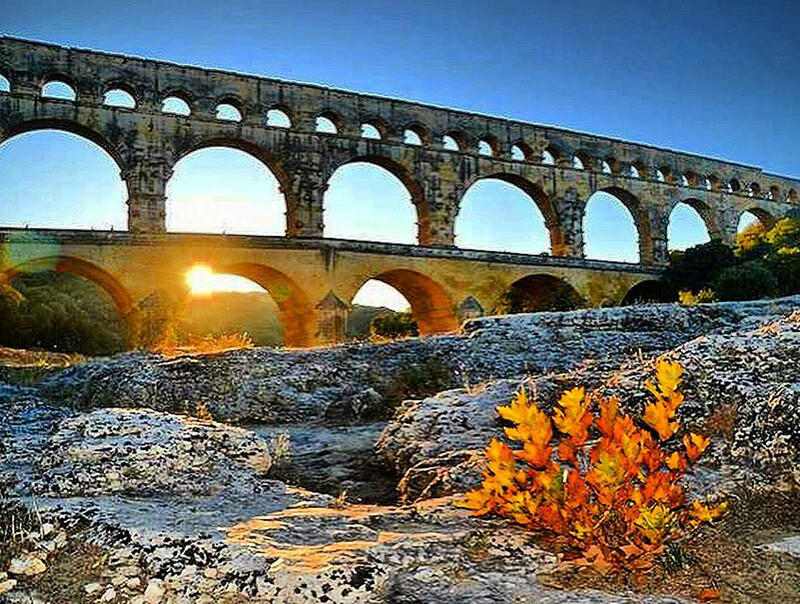 Le Pont du Gard was added to UNESCO’s list of World Heritage sites in 1985 because of its historical importance. 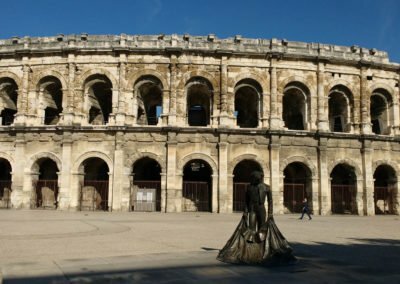 Founded in 35 BC by Roman veterans of the Second Legion of Roman Gaul, the commune rapidly grew into a flourishing trade center on the road between Arles and Lyon. 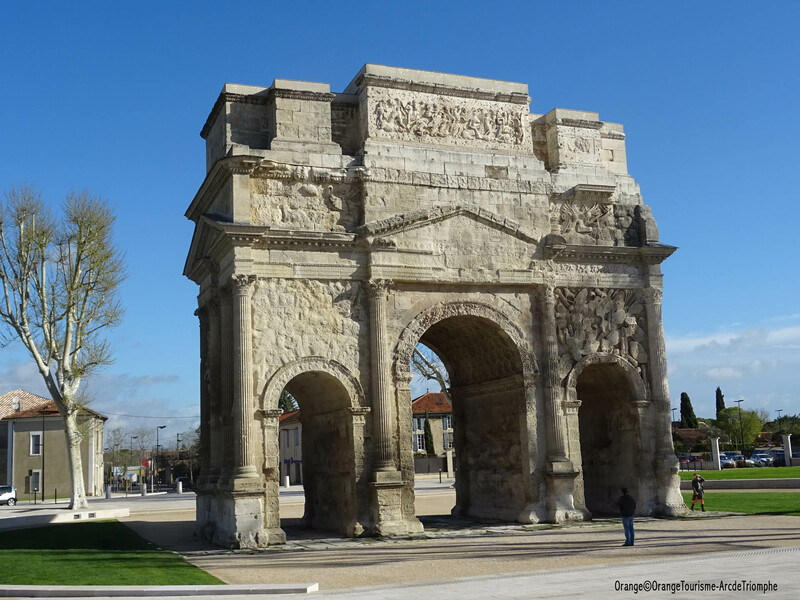 In 21 AD a spectacular triumphal arch (Arc de Triomphe) was built to guard the northern entry points of the town. It was later restored in the 1850’s. 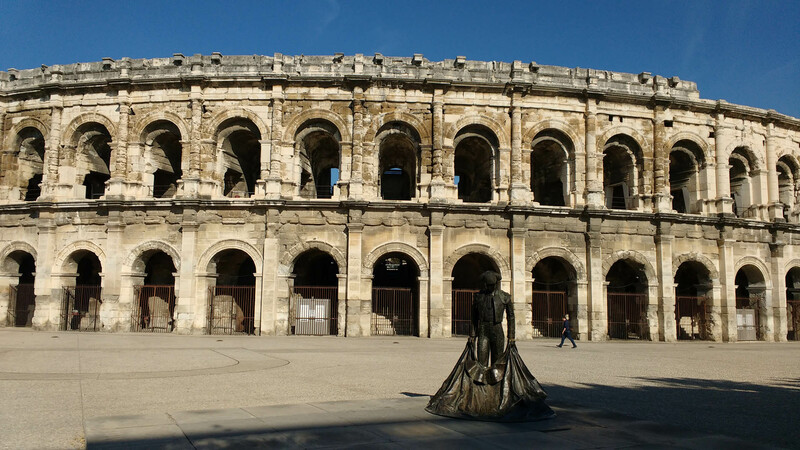 Many of the magnificent Roman monuments in Orange are now classified as World Heritage sites by UNESCO. 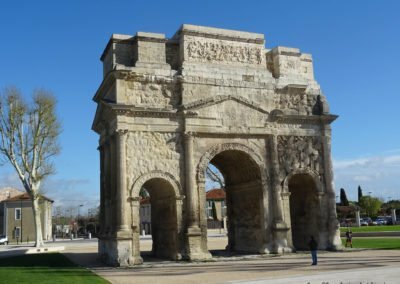 Arc de Triomphe: Built of 3 limestone arches and measuring over 19 meters in length and height, it is one of the largest Triumphal Arches of the Gallo-Roman period to have survived until today. 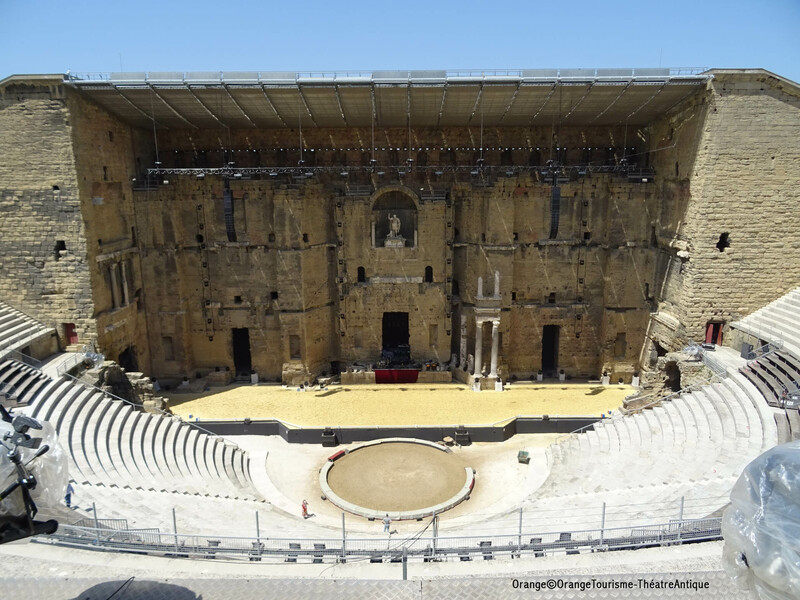 Théâtre Antique: One of the best preserved Roman theaters in the world, it is easily recognised by its iconic and gigantic backstage wall with its statue of Emperor Augustus, still intact. 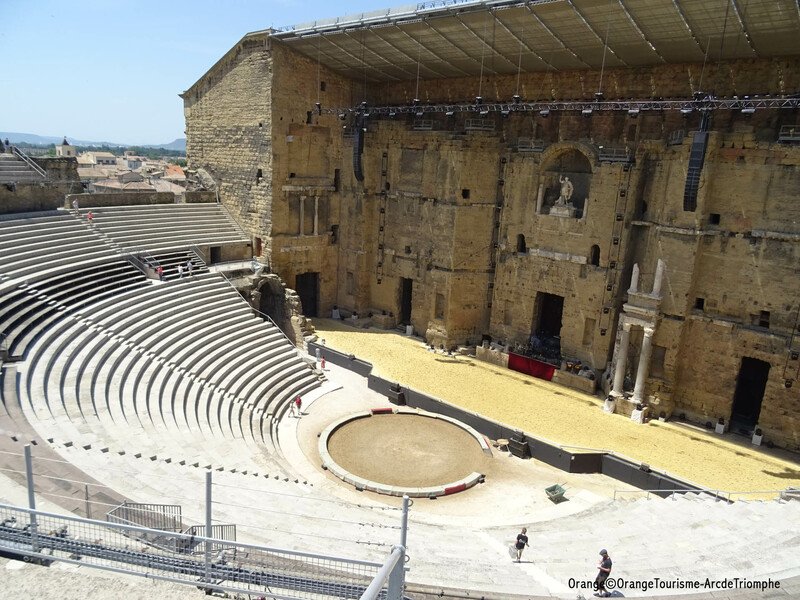 Spectators used to gather here for gladiator fights and Greek tragedies; nowadays it hosts the celebrated Chorégies d’Orange opera festival. Vignoble de Châteauneuf du Pape: Wine tastings and cellar tours in southern Franxe’s most famous wine appellation. 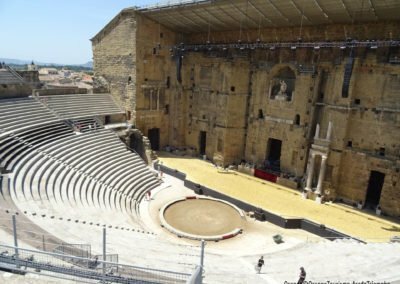 Vaison la Romaine: An open-air museum of Roman ruins and theaters. 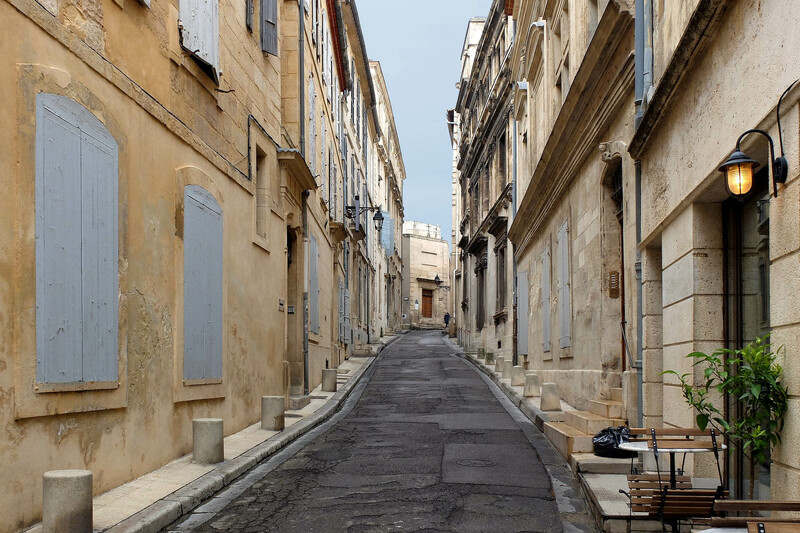 Carpentras: Make sure to visit the City Gate (la Porte d’Orange), the synagogue and the Gothic Cathedral of Saint- Siffrein. 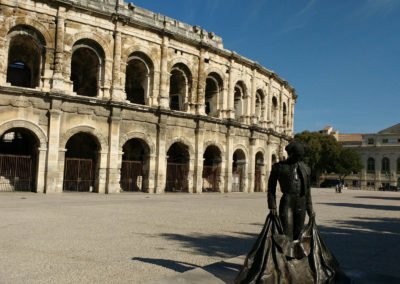 After Emperor Augustus’s victory over Antony and Cleopatra, which is represented as a chained crocodile in the town’s coat of arms, he presented Nîmes as a gift to the veterans of his Egyptian army. 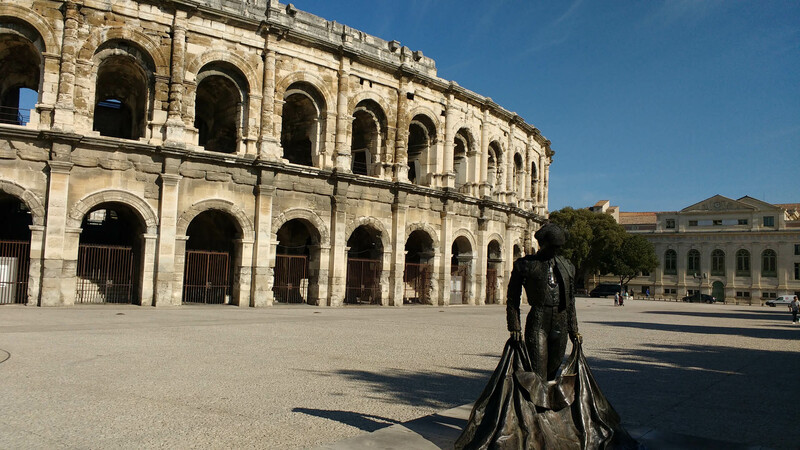 Nîmes is not only Roman and Provençal, a town of the Camargue region, in the Languedoc, with a Hispanic past, it is also the birthplace of blue jeans, the place where denim (a contraction of de Nîmes) was invented. 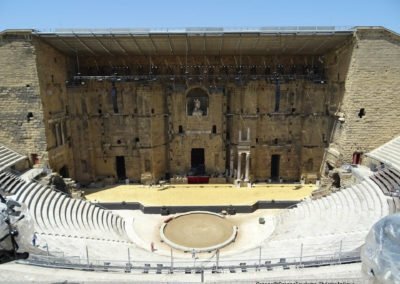 Roman Amphitheater: Built at the end of the 1st century AD the arena was first used for gladiator battles after which it served for feeding Christians to the lions. La Maison Carrée: French for “square house”, this beautifully preserved temple was built by Emperor Augustus for his grandsons and adopted heirs. Tour Magne: A Gallo-Roman monument overlooking the city, the tower stands at the summit of Mont Cavalier, from where it dominates the entire plain. Les Jardins de la Fontaine: A magnificent 18th C park built around the sacred Nemausus spring which later gave its name to the city- Nîmes.